When a major tournament clashes with the festival, and England are playing, there is always one question that tops all others: Will they show the football? 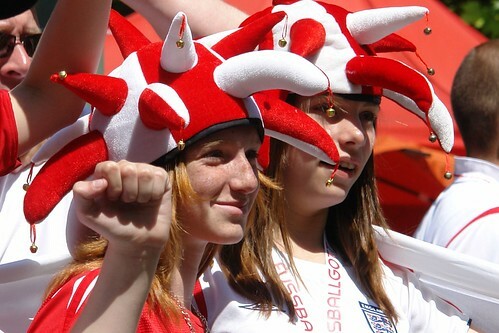 For the 2010 World Cup, festival goers wanting a bit of Three Lions action shouldn't be disappointed. A source close to the festival has confirmed to GlastoEarth that a decision to show the England games was made some time ago, and speculates that more than one venue could be used to alleviate crowding. In the Euro 2004 championships, an estimated 60,000 gathered at the Pyramid stage on the Thursday of the festival, forming the largest crowd of England supporters assembled for that game, in the world. England lost the game on penalties and were knocked out of the competition. In 2010, England face Slovenia in their final group game on the Wednesday. Having been drawn in a weaker group, it is anticipated that the team will qualify, meaning a critical knockout game on either the Saturday or Sunday of the festival is likely. The last time a similar game was played - a knockout game clashing with the main music schedule in 1998 - the festival showed the match in the Cinema field. With the Cinema field repurposed in 2009, speculation will no doubt continue as to where the game might be shown. GlastoEarth's guess - it won't be a main stage. So if you own a giant screen, you might want to call Mr Eavis. He could well be up for renting a few more than usual. Used under the Creative Commons non commercial license.